Because concrete is among the most affordable material options, it is often used for retaining walls in landscaping. But compared to more expensive materials, concrete walls often appear plain. Although the function of a retaining wall is to hold back the soil on hillsides, homeowners also want aesthetically pleasing retaining walls that enhance the rest of the landscape. Plain gray concrete can drab down even the most colorful patio and landscape design. Choose from a wide variety of options to disguise the concrete retaining wall, some of which actually make the wall look much more expensive. Clean the wall to remove any debris, using warm, soapy water and a brush. Strip the concrete wall of any paint with a pressure washer, sandblaster or chemical stripper. 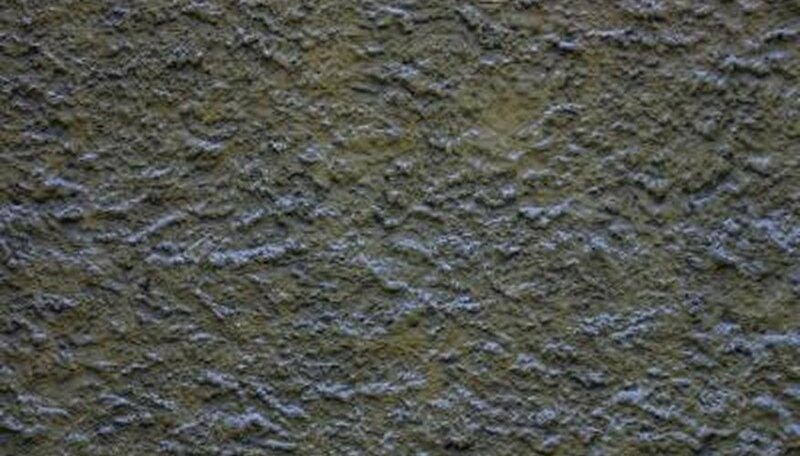 Apply a textured stucco finish to the wall with bonding cement or waterproof coating and a texture tool, such as a sponge or brush. Although the concrete is still visible, the new finish provides a new look and can be painted any color to get away from boring cement gray. Drill vinyl stone veneer panels into place over the concrete retaining wall. Cut the pieces to fit, drill pilot holes with a masonry bit, then use plastic anchors to hold the screws in place. Cover the wall with thin stone veneer applied with a mortar mixture of 2 parts sand and 1 part Portland cement. Spread the mortar onto the wall 1/2 inch thick, apply a thin coat of mortar to the back of the stones, press the stones in place, then grout the gaps when all the stones are set. Cover the concrete wall with decorative lattice; screw thin trim boards into the concrete so the lattice juts out from the wall slightly, encouraging the plants to wrap around the narrow strips. Plant climbing vines in front of the wall and train them to climb up the lattice to disguise the concrete. Plant cascading plants in the soil at the top of the wall. As the plants grow, they will conceal and disguise the top and front of the wall.